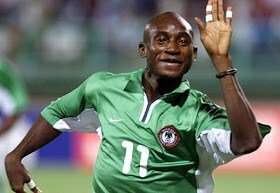 Former Super Eagles winger, Femi Opabunmi has revealed how he was swindled by some pastors in the South West part of Nigeria in a bid for him to regain his sight. The player told Complete Sports that he suddenly lost his sight during training with his French second division side, Niort in 2006. He said after two unsuccessful surgery in France, he returned to Nigeria in search of a cure for his partial blindness, but according to him, he was duped by Nigerian pastors. Opabunmi was one of the best players at the 2001 FIFA U-17 World Cup where he helped Nigeria reach the final. “Funds were given to me to survive by my former teammates (including Osaze Odemwingie) and well wishers. “I gave pastors some of the money, hoping that if I got healed I would start afresh with a coaching career. “I visited several churches and mountains in search of a cure but it never happened. “They duped me of my small cash. I paid more that N400,000 to pastors to see that I got cured but nothing happened.